Our third litter was born 18:th of June 2005. As all our litters the names of the kittens are taken from the Eurovision Song Contest (ESC)! The theme this time was that all the names begin with "My". There are two blue mitted girls named "My Star" [Latvia 2000] and "My Sweetheart" [Serbia& Montenegro 2004] (My Sweetheart is a translation of the original title "Lane Moje". 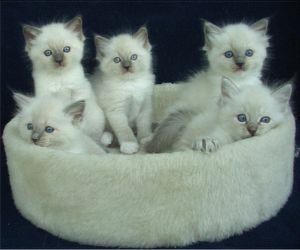 The blue mitted boy is named "My Galileo" [Belarus 2004]. The blue Den colourpoint boy is named "My Number One" [Greece 2005]. Last but not least we have our blue tabbycolourpoint boy "My Heart Goes Boom" [Norway 2000].